Hail, full of grace, the Lord is with you! Our devotions to St. Jude include a special Mass every year on his feast day, October 28th, veneration of his relics every Friday after the 12:10pm Mass, and a prayer to St. Jude at the end of the Rosary Monday through Friday at the end of the daily rosary in the Church. Our new St. Martin de Porres Shrine was blessed on February 6, 2018. It is in memory of Fr. Norman Haddad, OP, former pastor of St. Dominic Church, known for his dedication to the poor. St. Martin de Porres is a Dominican saint who lived from 1579 to 1639 in Lima, Peru. He is known for his deep prayer and devotion, austere lifestyle, miracles, humble service in the Dominican priory, daily ministry to hundreds of poor in Lima, and love for animals. Because his mother was a freed slave of African descent and his father a Spanish nobleman, he is the patron of persons of mixed races. He is also the patron saint of barbers, innkeepers, and public health workers. 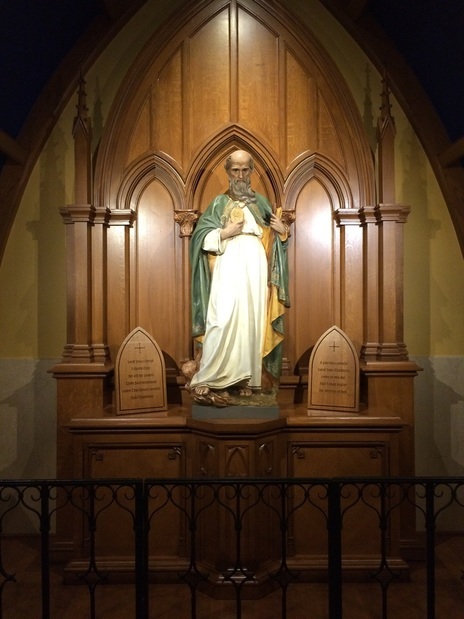 We encourage you to visit the new shrine often, asking for the power of his prayers upon your many needs. St. Martin de Porres, pray for us! 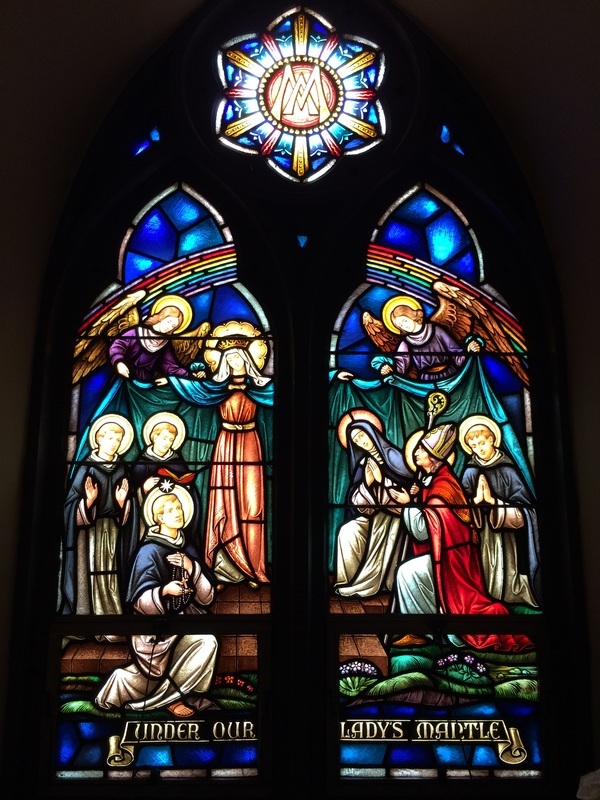 Under Our Lady's Mantle Window: St. Dominic had a future vision of heaven, and many members of all the other religious orders were seen, but no members of the Order of Preachers were anywhere to be seen. After feeling deeply troubled about this and asking where they all were, Jesus drew Dominic's attention to Our Lady. Our Lady then proceeded to open up her mantle . . . and there, underneath her mantle were all the Dominicans, a vast multitude! Salve Regina Window. Photo taken from the outside at night.